The Greek conquests of India took place in the years before the Common Era, and a rich trade flourished between India and Greece, especially in silk, spices, and gold. The Greeks invaded India several times, starting with the conquest of Alexander the Great between the years 327 to 326 B.C.E. 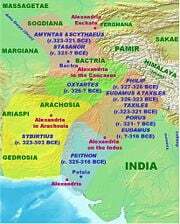 Alexander launched his conquest of India by invading Punjab in 327 B.C.E. The Battle of Hydaspes (326 B.C.E.) marked the first engagement in which Alexander captured Aornos fortress after ferocious fighting. 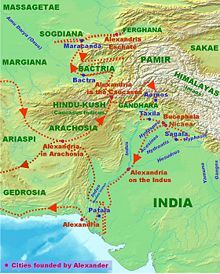 Alexander pushed to the headwaters of the Indus River successfully when, encountering the powerful Magadha empire armies, his army mutinied at Hyphasis. Alexander divided his forces, leading one group campaigning successfully to the Indian ocean then back to Persia. The second group under general Craterus marched to Carmania in today's southern Iran. Alexander left Greek troops in Taxila (today's Pakistan). They governed the region until 316 B.C.E. The Macedonians helped a league of tribes overthrow the Nanda Dynasty. King Chandragupta consequently founded the Maurya empire in northern India. Seleucus I Nicator, one of Alexander's generals, invaded today's Pakistan and Punjab in 304 B.C.E., founding the Seleucid dynasty. From 180 B.C.E. to 10 C.E. the Greek empire expanded the Greco-Bactrian dynasty into northwest and northern India. Their rule of the region ended with the Scythians and Kushans successful invasion. In 327 B.C.E., Alexander the Great began his foray into Punjab. King Ambhi, ruler of Taxila, surrendered the city to Alexander. Many people had fled to a high fortress/rock Aornos which Alexander took by siege. Alexander fought an epic battle against the Indian monarch Porus in the Battle of Hydaspes (326). After that victory, Alexander made an alliance with Porus and appointed him satrap of his own kingdom. Alexander continued his successful conquest throughout the headwaters of the Indus River. East of Porus' kingdom, near the Ganges River, the powerful kingdom of Magadha reigned. Exhausted and daunted by the prospect of facing another formidable Indian army at the Ganges River, his army mutinied at the Hyphasis (modern Beas), refusing to march further East. Alexander, after the meeting with his officer Coenus, determined turning back toward Greece the best course of action. Turning south, Alexander conquering his way down the Indus to the Indian Ocean. He sent the largest part of his army to Carmania (modern southern Iran) under his general Craterus, and commissioned a fleet to explore the Persian Gulf shore under his admiral Nearchus. In the meantime, Alexander led the rest of his force back to Persia by the southern route through the Gedrosia (modern Makran in southern Pakistan). Alexander left behind a contingent of Greek forces which established themselves in the city of Taxila, now in Pakistan. Several generals, including Eudemus and Peithon, governed the newly established province until around 316 B.C.E. Sophytes (305-294 B.C.E. ), one of the governors, established himself as independent Greek prince in the Punjab. Androcottus, when he was a stripling, saw Alexander himself, and we are told that he often said in later times that Alexander narrowly missed making himself master of the country, since its king was hated and despised on account of his baseness and low birth (Plutarch 62-3). The Macedonians (described as Yona or Yavana in Indian sources) may also have assisted, in league with Indian tribes, in the uprising of Chandragupta against the Nanda Dynasty. The Mudrarakshasa of Visakhadutta, as well as the Jain work Parisishtaparvan, discuss Chandragupta's alliance with the Himalayan king Parvatka, often identified with Porus. That Himalayan alliance gave Chandragupta a powerful army comprised of Yavanas (Greeks), Kambojas, Shakas (Scythians), Kiratas (Nepalese), Parasikas (Persians), and Bahlikas (Bactrians) who took Pataliputra (also called Kusumapura, "The City of Flowers"): "Kusumapura was besieged from every direction by the forces of Parvata and Chandragupta: Shakas, Yavanas, Kiratas, Kambojas, Parasikas, Bahlikas, and others, assembled on the advice of Canakya" (Mudrarakshasa 2). With the help of those frontier martial tribes from Central Asia, Chandragupta defeated the Nanda/Nandin rulers of Magadha, leading to the founding of the powerful Maurya empire in northern India. 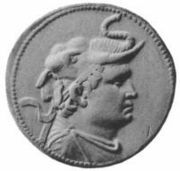 Seleucus I Nicator, founder of the Seleucid dynasty and one of Alexander's former generals, invaded Pakistan and modern Punjab in northern India in 304 B.C.E. Chandragupta Maurya put an army of 100,000 men and 9,000 war elephants in the field, forcing Seleucus to form an alliance with Chandragupta. Seleucus gave him his daughter in marriage and ceded the territories of Arachosia. 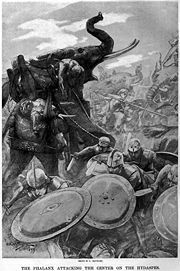 In return, Chandraguta gave Seleucus 500 war elephant which Seleucus used to win a decisive victory in the Battle of Ipsus. Seleucus also sent Megasthenes as his ambassador to Chandragupta's court. Megasthenes visited Pataliputra (modern Patna in Bihar state), capital of Chandragupta, often. He wrote a detailed description of India and Chandragupta's reign. The Seleucids and the Mauryan emperors maintained cordial relations strengthened by frequent diplomatic exchanges until the fall of the Mauryan empire. In 180 B.C.E., the Indo-Greeks, invaded parts of northwest and northern India, taking over the Punjab region. The Greek rule constituted of an extension of the Greco-Bactrian dynasty of Greek kings (the Euthydemids) located in neighboring Bactria. The invasion of northern India followed the destruction of the Mauryan dynasty by the general Pusyamitra Sunga, who then founded the Sunga dynasty (185 B.C.E.-78 B.C.E.). The Indo-Greek king Menander may have campaigned as far as the capital Pataliputra in eastern India (today Patna): "Those who came after Alexander went to the Ganges and Pataliputra" (Strabo, XV.698). The Indian records also describes Greek attacks on Saketa, Panchala, Mathura and Pataliputra (Gargi-Samhita, Yuga Purana chapter). The Indo-Greeks ruled various parts of northwestern India until the end of the first century B.C.E., when the Scythians and Kushans conquered them. ↑ Michael Wood, In the Footsteps of Alexander the Great: A Journey from Greece to Asia (Berkeley: University of California Press, 2001), 198. ↑ D. G.Hogarth, Philip and Alexander of Macedon: Two Essays in Biography (New York: C. Scribner's Sons, 1897), 257. ↑ Perseus, Plutarch 62-3. Retrieved January 24, 2009. ↑ John Hubert Marshall, A Guide to Taxila (Cambridge: For the Dept. of Archeology in Pakistan at the University Press, 1960), 18. ↑ Sanskrit original: "asti tava Shaka-Yavana-Kirata-Kamboja-Parasika-Bahlika parbhutibhih Chankyamatipragrahittaishcha Chandergupta Parvateshvara balairudidhibhiriva parchalitsalilaih samantaad uprudham Kusumpurama." From the French translation, in "Le Ministre et la marque de l'anneau," ISBN 2-7475-5135-0. ↑ G.I.A.D. Draper, Michael A. Meyer, and H. McCoubrey, Reflections on Law and Armed Conflicts: The Selected Works on the Laws of War by the late professor colonel G.I.A.D. Draper, OBE (The Hague: Kluwer Law International, 1998), 38. ↑ Ajay Mitra Shastri, The Age of the Sātavāhanas. Great Ages of Indian History (New Delhi: Aryan Books International, 1999), 14. Draper, G.I.A.D., Michael A. Meyer, and H. McCoubrey. 1998. Reflections on Law and Armed Conflicts: The Selected Works on the Laws of War by the Late Professor Colonel G.I.A.D. Draper, OBE. The Hague: Kluwer Law International. ISBN 9789041105578. Hogarth, D. G. 1897. Philip and Alexander of Macedon: Two Essays in Biography. New York: C. Scribner's Sons. OCLC 1535188. Marshall, John Hubert. 1960. A Guide to Taxila. Cambridge: For the Dept. of Archeology in Pakistan at the University Press. OCLC 833691. Shastri, Ajay Mitra. 1999. The Age of the Sātavāhanas. Great Ages of Indian History. New Delhi: Aryan Books International. ISBN 9788173051593. Wood, Michael. 2001. In the Footsteps of Alexander the Great: A Journey from Greece to Asia. Berkeley: University of California Press. ISBN 9780520231924. History of "Greek conquests in India"
This page was last modified on 14 July 2017, at 23:14.